One of the highlights of the day was planting of a garden. “One of the boys in the new home likes to garden. So we thought it would be nice to help him with that” said Penny, the Executive Director for Habitat Catoosa. Using three old wooden barrels the team was able to plant some vegetables in each one so the family could have fresh produce later this year. 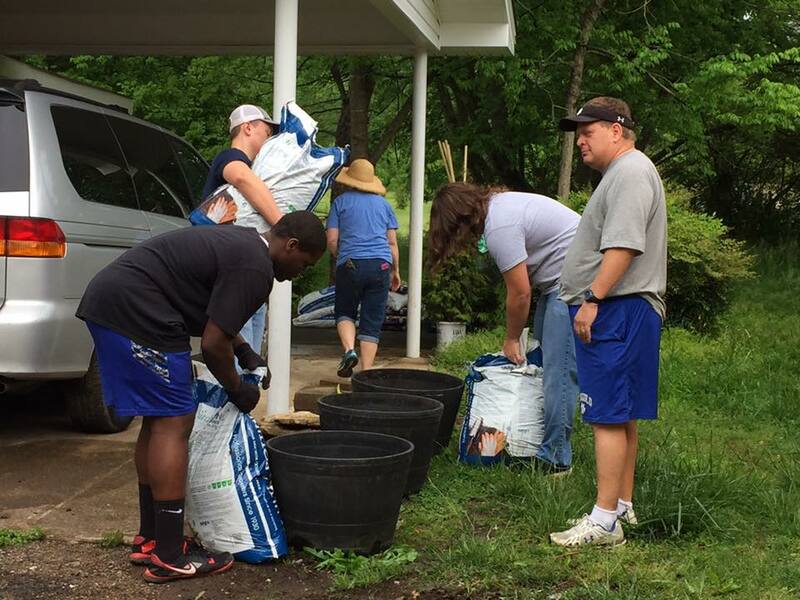 The football team was also able to plant flowers, mow the lawn, and plant shrubs around the home. “Sherry now has a home she can be proud of both on the inside as well as the outside” Penny said of the new homeowner. “We are now a huge Ringgold football team fan!” The project was a collaboration between Habitat Catoosa, Ringgold High football team, and Holcomb Garden Center. “Holcomb donated all the materials that we used here today. Without their donation we would not have been able to accomplish what we did today” voiced Penny. Holcomb Garden Center of Ft. Oglethorpe, GA supplied all the flowers, soil, and vegetables needed to help make the project a success. If you would like to volunteer for Habitat for Humanity of Catoosa, or donate, please email Habitat1@catt.com or visit their website at catoosahabitat.org.